Cut potatoes in half. If necessary, cut thin slice from bottom of potato halves to level. With small spoon or melon baller, scoop out center of cooked potatoes, leaving 1/8-inch shell. Place scooped out potato (not shells) in small bowl. Add 1 teaspoon chives, thyme, salt, garlic powder, sour cream, margarine and milk; mash until smooth. 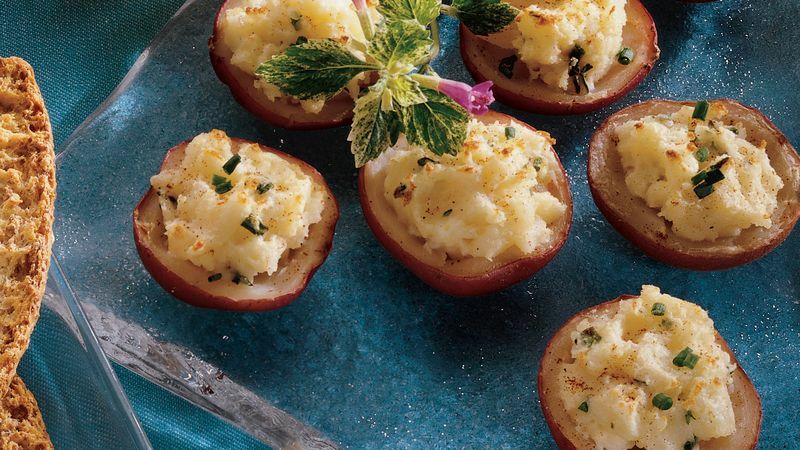 Pipe or spoon potato mixture into potato shells. Place on ungreased cookie sheet. Broil 4 to 6 inches from heat for 3 to 5 minutes or until hot and lightly browned. Sprinkle with paprika and chives. Arrange filled potatoes on serving plate. If desired, garnish plate with fresh thyme. MAKE-AHEAD TIP: Prepare potatoes and top as directed in recipe; place in shallow pan. Do not broil. Cover; refrigerate up to 24 hours. Broil as directed in recipe.